Rowan is a deciduous tree or shrub; reaches a height of 50 feet, the stem has close and smooth gray bark. The leaves are alternate and odd-pinnate, with 9-15 oblong-lanceolate, serrate leaflets which are usually finely hairy underneath. 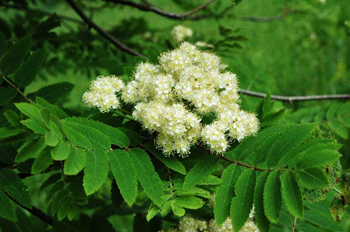 Numerous small white flowers appear in compound, terminal, shaggy corymbs during May and June, developing eventually into a berry-like, pea-sized, red pome which ripens in the fall. 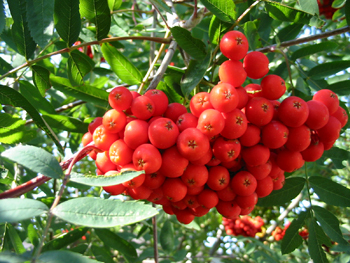 Another variety: American mountain ash (S. americana) can also be used in the same way. This shrub or tree grows to 30 feet high and is found from Newfoundland to North Carolina and Michigan. Grows wild in the deciduous forests and mountains of Europe and Asia. Often planted for ornament there and elsewhere. Used to flavor liqueurs and cordials. The fresh juice of the fruit is mildly laxative and is useful to soothe inflamed mucous membranes; it makes a good gargle for hoarseness and sore throat. When made into a jam, the juice or fruit becomes astringent and useful for mild cases of diarrhea. One of the sugars contained in the fruit is sometimes given intravenously to reduce pressure in the eyeball in cases of glaucoma. Used also for piles, urinary difficulty, indigestion, gall bladder ailments, angina, coronary problems, blood purifier, appetite stimulant, scurvy, worms, boils, tonsillitis. Juice: take 1 tsp. fresh juice at a time, as needed. Cold extract: soak 1 tsp. dried fruit in 1 cup water for 10 hours. Take 1 cup per day. Jam: cook fruit with half as much sugar as berries. Take 1 tbsp., 3 to 5 times per day for mild diarrhea.